SB 1083 – Requires each school district and charter school to provide at least two “recess” periods during the school day for students in kindergarten through third grade this year, and beginning August 2, 2019, each school district and charter school is required to provide at least two “recess” periods through fifth grade. HB 2088 – To improve the health and safety of Arizona’s students, this bill requires schools to notify parents if their child is being harassed, threatened or intimidated at school. It also requires schools to notify parents if their child is suspected of sustaining a concussion in a practice session, game or other interscholastic athletic activity. HB 2484 – Requires local Arizona governments to tax all food items equally. The measure prohibits cities, towns, and counties from imposing extra taxes on soda or sugary drinks. HB – 2083 makes the English version of all insurance agreements the legally binding form. If a customer receives a contract in another language that has conflicting language, the English version trumps the foreign language version. HB – 2588 makes it illegal to misrepresent a pet as a service animal, punishable by a $250 fine. HB 2154 – requires businesses or organizations that own confidential customer data to notify people if their data is breached. Affected individuals must be notified within 45 days after the breach is discovered. HB 2464 – extends the expiration date of eggs labeled, ‘Grade A.’ Current Arizona law requires eggs to have a ‘sell by’ date of 24 days after they were inspected by egg dealers. The new law extends that by three weeks for eggs labeled, ‘Grade A.’ Expiration dates for Grade AA eggs won’t change. HB 2006 – prohibits marriage for children under the age of 16. 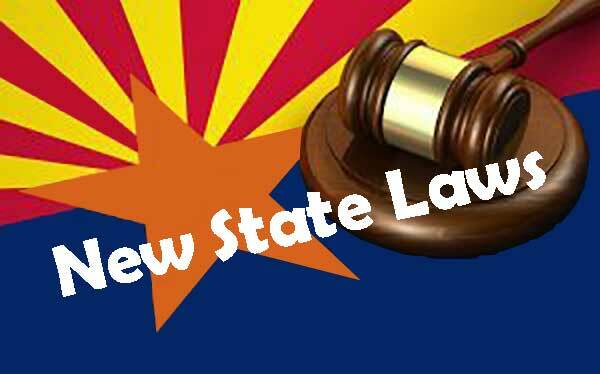 Prior to this law, Arizona did not have a minimum age for marriage. The bill allows children ages 16 and 17 to marry someone no more than three years older with parental consent, or if they are legally emancipated. SB 1517 – designates the Sonorasaurus as the official state dinosaur. The species was discovered in southern Arizona. It got its name from amateur fossil hunters that found the only know specimen in the Sonoran Desert in 1994.